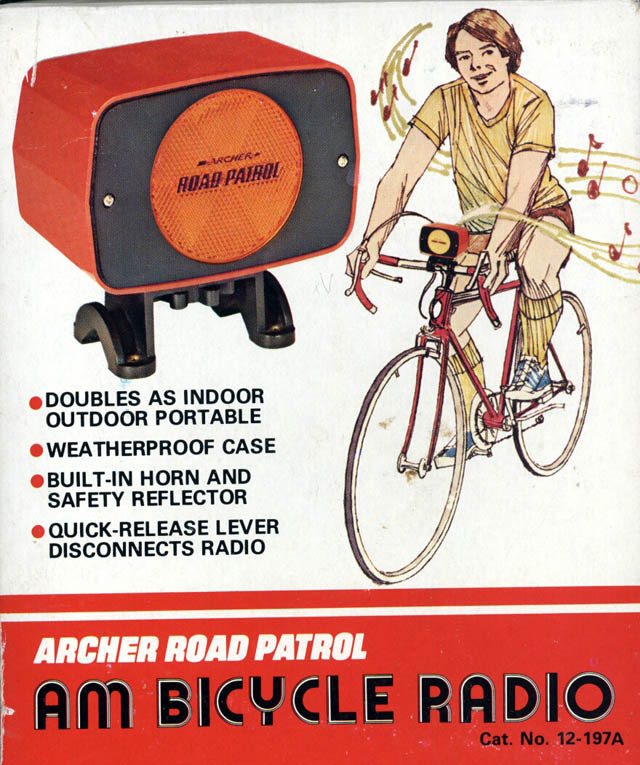 There are some folks who think that listening to music while biking is unsafe or some kind of abominable crime against cycling purity. I’m not one of them. There are days when you’re riding by yourself when the wind won’t quit blowing or there’s a long climb coming up or you want to have something to give you a little boost. Music does that for me. I don’t ride with earbuds because I find them uncomfortable (and illegal to wear in some locations), so I’ve tried various combinations of amplified and unamplified external speakers. You can read the full review here. 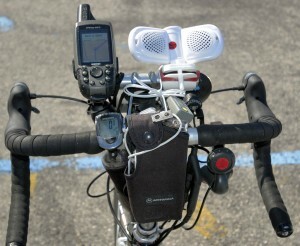 A video that compares all of the speakers is here, including a real-world test on the bike. Unfortunately, my second choice – the Byco WRX1 – may not be available any more. It didn’t show up on Amazon and all my Google searches hit dead ends. The Active Tunes i-Ride Classic is about half the price of the i-Ride Pro, but doesn’t do a bad job. It looks like a pair of Mickey Mouse ears perched on the bars of my Trek 1220, but Kid Matt has been happy with it since I gave it to him. The Sandisk Sansa Shaker and The Boostaroo had some interesting features, but the former ended up with my grandson and the latter never made it on the road. My 40 GB iPod Classic was growing some whiskers and remote controls were getting hard to find, so I decided to go small and cheap with a Sandisk Sansa Clip. The iPod cost me $483; the Sansa Clip was about $60. That made it a lot lighter on the wallet AND on the bike. 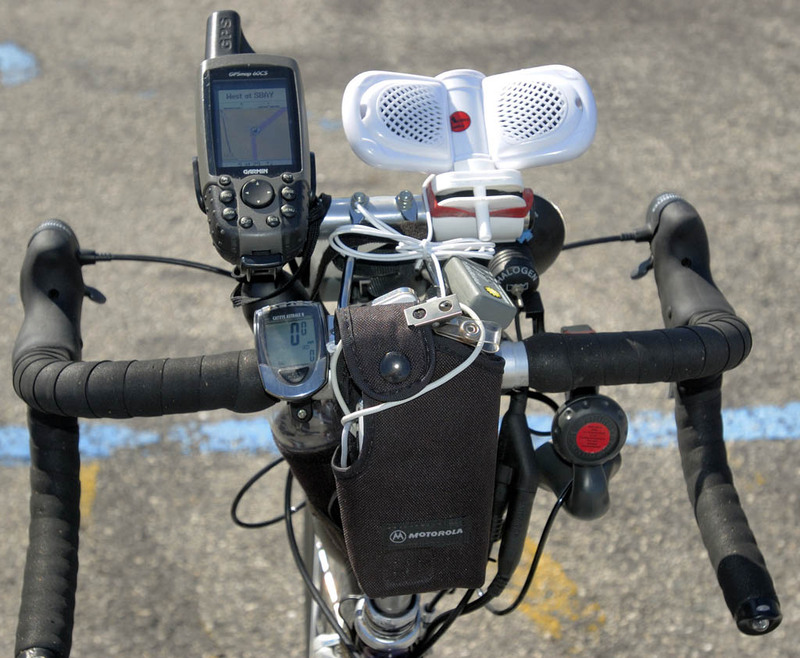 It charges through a standard USB mini plug, the same connector as my flash card reader, Olympus WS-500M Digital Voice Recorder, portable hard drives and Garmin nüvi 760 GPS. It has a built-in FM radio tuner which works surprisingly well. It’s tiny: about .7″ deep, 1.4″ high and 1.4″ wide. Like I said, just barely bigger than the remote control for my iPod. Four-line OLED display that’s really bright. Reasonable intuitive controls. All I need are pause, skip and volume when I’m on the bike. It connects to my Active Tunes i-Ride pro with a standard miniplug. Bikes and Music: a recipe for pain? I can’t see an experienced cyclist like you telling people to listen to music while they ride. Diverting your attention from any of your senses while riding is a recipe for pain. If you want to listen to music, take a ride in your car, or lounge around on your sofa. Audio if properly used, can add to enjoyment and concentration. Surgeons have favorite playlists for surgery and it is not a distraction. So during surgery, driving, working, running, walking, and riding, properly listening to audio can add to the enjoyment/concentration of/on the activity…Used properly (so you can hear surrounding sounds as well as audio), for some, audio can add to the enjoyment/concentration and at times provides motivation… If I find myself riding (or running) in a situation where I need to turn off the audio to improve my ‘concentration’ or “reduce distraction” ..I do so…. Just don’t make the assumption that just because I listen to music or an audiobook … that I’m an unsafe rider or runner or surgeon. Now that we have THAT cleared up, go here to see what I listen to on the road. Is there a decent bookmarking feature on that Sansa Clip, or even one at all? This would be for going back to the places where I left off — in multiple books. I’m not sure about the bookmarking feature. It’s not mentioned in the online docs. You can create playlists, and when turn the unit on, it goes to where you stopped off, as best I remember. I only load one playlist at a time, so I don’t know if it would remember where it was in EACH list. I’ll play with it when I get a chance to find out. My son has the 2Gb version and listens to a lot of podcasts with his. Maybe he’ll weigh in. I took the advice from your review earlier this year and bought the Active Tunes device. It’s a great, convenient little device. I was pleasently suprised at the speaker volume while riding. It also fits the nano perfectly. Active tunes originally sent me a box without the speaker, but after an e-mail to them they sent another one out with the speaker. Thanks for the review. I bet you thought that speaker WAS light before you opened the box. I’ve found the Active Tunes folks to be very responsive. Glad you found the review helpful and I didn’t lead you astray. Thanks for the comparison. I’m intrigued by these speaker systems. I don’t have the money for such frivolities right now, but my interest is piqued. I have a Sansa Fuze and love it … I think maybe it’s bigger than the Clip though. 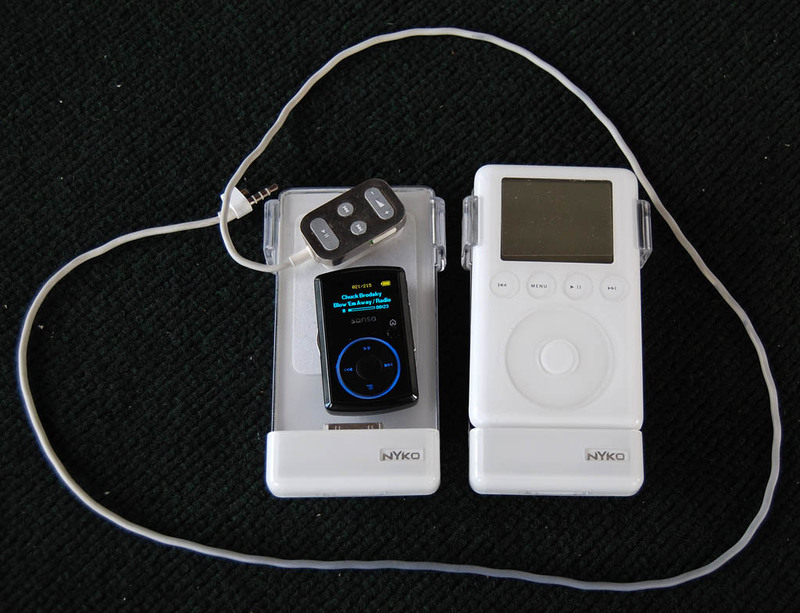 The whole Sansa mp3 player lineup is really nice. If I had a complaint about the Clip, it’s that it’s almost TOO small. I’m afraid I’m going to misplace it. The iPod Classis was heavy enough that there was no doubt that it was there. Dude! I need one of these. Thanks so much for the reviews! The tune i-Ride pro is charming and I like it. Note: I have to withdraw my endorsement of the Active-Tunes products because of numerous complaints of orders not being shipped in a timely manner (or at all). The New Jersey Better Business Bureau has given them a Grade of F for not being responsive. I’m sorry to have to write that. They made a great product.